Thursday, December 10th 2011 was the big day for the DCWEEK 2011 festivities. The Core Conference, an all day affair, was held this year at the Artisphere in Rosslyn, VA. The venue was beautiful and the spaces were well set up for the sessions that would be held throughout the day. I got there a little bit before 9:00AM and took some time to find my way around the different rooms. I decided that I would be following the Mobile sessions, due to my latest interest in mobile development, and the different panels that were scheduled for the day looked interesting. The first session of the day, a panel titled “Trends & Innovative Uses of Mobile APIs” was held in the Dome Theatre and speakers included Keith Casey of Twilio, Eric Johnson of el-studio.com, Mike Panchenko of SimpleGeo, Zvi Band of Contactually and was moderated by Hemang Gadhia of Condaptive. As implied by the title, the discussion was focused more on a high level view of APIs used to build mobile apps and their advantages and disadvantages. 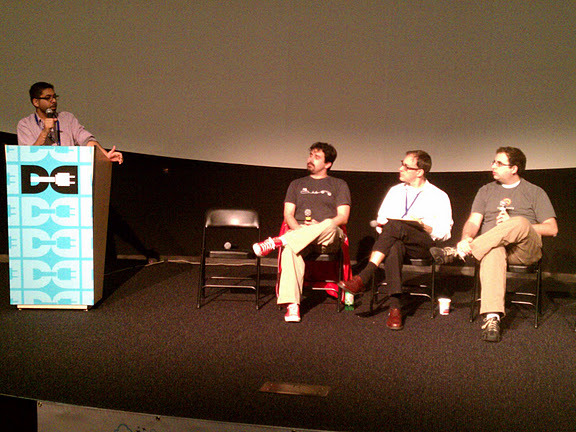 Panelists discussed the importance of trust as a deciding factor before picking APIs. Deprecation support was also cited as critical, as it is important for API providers to support deprecated features while providing newer ones in their latest releases. To the question of determining successful API implementation, the panel identified ease of use and documentation as examples of major factors. For API providers as well, getting their API used by bog companies serves as an endorsement for others to proceed. The panel praised the ease of entry that APIs provide to mobile developers, while pointing out that real skills now lies in creativity. APIs are so pervasive that app building can be compared to the renaissance f the mashup. As for issues of privacy, the panelists pointed out that mobile developers should be aware of the legal implications of using external providers and make sure to cover themselves in their privacy policies. Using Facebook and Twitter (OAuth) is seen as a necessary evil, because of the ease of access it provides the majority of users. The standards the panelists recommended using are built around JSON and REST. Overall this was a lively discussion with a knowledgeable panel, and the moderator Hemang asked very relevant and thoughtful questions which made for a interesting discussion. attendance, was the most attended mobile session of the day. The panel was moderated by Judy Thomas of EightShapes, with the participation of Nick O’Neil of Holler, Sol Lipman of AOL, Brett Battjer of Living Social and Geno Yoham of Winamp. This was a lively panel, made even more so by Sol Lipman whose quick wit kept the crowd entertained and laughing. Sol explained how AOL will become a mobile company because a lot of its content, as with the web in general is consumed through mobile. The panel touched on the topic of responsive design, which they acknowledged was tough to implement especially in a mobile e-commerce setting because of flow, which has to account for the OS and its features, but also because of content. 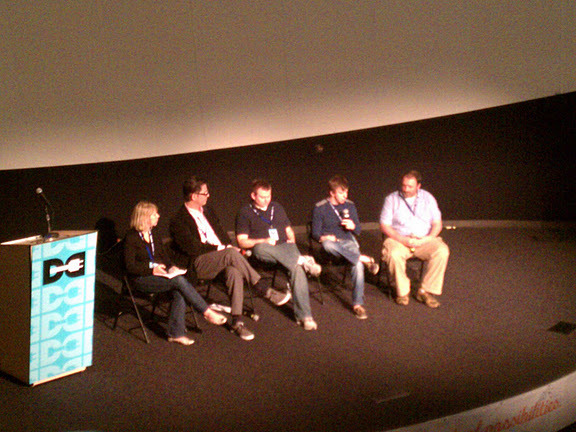 The panel then was asked about the challenge of designing for tablets. The answers from the panel highlighted how tablets are a different animal than smartphones because tablets offer of more interactive and engaged experience. They are also used in a different context and a more cautious approached needs to be used than merely converting a smartphone app to a tablet app. No matter what, tablet development can no longer be ignored because they are an increasing part of the marketplace. As to how developers should respond to negative feedback from users, panelists answers ranged from “We go after them!”(Sol) to understanding that not all user feature requests should be acted on. Implementing a way to get crash reports from apps was also very helpful in understanding bug report and fixing issues. The panel also stressed the importance of app design as customers do pay attention to look and feel. Users look for utility in apps, complemented by two or three killer features. Advertising was touched on, and was deemed a necessary evil, especially for product managers who’d rather keep their product design free of ads. Some businesses do not make money right away and must take the long term approach but in general paid ads was the standard way of generating revenue. The topic of advertising was carried on in the next session, right after lunch (Baja Fresh) aptly titled “Creative Mobile Marketing: From QR Codes to In-App Selling”. This panel discussed new and innovative approaches to mobile marketing and was moderated by Christopher Brown of Millenial Media. Panelists included Chris Watland of Signal, Michael Scully of 2ergo, Jessica Pointer of API. This was a good talk if you were a company looking to get information on the benefits and process of going about mobile marketing. One thing that came out clear from the panel was the mobile marketing has to be understood as part of an overall marketing strategy. Designing a message for an audience to be delivered through a mobile medium requires creativity, simplicity, and first that the audience for the message be understood. This involves continuously learning about the audience and refining the message. Examples of successful campaigns given by panelists include a deal between Orange a Telecom company and movie theaters to create a BOGO coupon for movie tickets on Wednesday night which brought in ten million of pounds. The panel pointed out that mobile campaigns sometimes are not about a specific goal but rather are focused on building brand recognition and awareness. QR Codes promotions have got to be worth their while for customers and not be used as gimmicks. For the future, the panelists agreed on a very personal and customized type of advertising catching on based on the rise of technologies such as Google Waller and NFC, as well as more personalized experiences via mobile websites. The last panel I attended was the “Future of Mobile Money”, which ended up being my favorite of the day due to the presence of Ben Milne, CEO of Dwolla. The panel was moderated by Stella Fayman of FeeFighters and also included Oktay Drogamaci of Paypal, and Matt Jacobson of Acta Wireless. The questions came from Stella and the panel provided thoughtful and sometimes very brash answers. When asked what would drive mobile payment growth, the panel provided part of an answer with an equal growth in smartphone usage, as well as in the ecosystem of device, but as Ben Milne pointed out, nobody really knows. Milne pointed how difficult it was to create a payment network because of the roadblocks put in place by banks for example. Oktay highlighted the work that Paypal did to enable mobile payment solutions for small retailers as part of their storefront capabilities offerings. Panelists agreed that there were the early days of mobile payment, and offered as examples of corporate early adopters, Toys R Us and Walgreens. Square was brought up many times in the discussion, once as potential competitors to Dwolla to which Milne was adamant that he did not consider them competitors since their business model was different, and also for their latest offering which allowed for proximity based payments. The one true gem in this discussion came from Ben Milne, who argued that the future of mobile payment was in authorization, outside of any physical device. On the topic of mobile payment and identity theft, the panel was unanimous that security is either managed poorly or efficiently. Milne argued that as far as ease of hack, mobile payment was not the path of least resistance. Oktay argued that as long as credentials were not stored on the phone and cloud storage was in place, chances of identity theft happening were pretty slim. Matt Jacobson pointed that under cloud based mobile payment system, card cancellation would be an easy step. Nobody on the panel was much concerned with privacy, as they put it, customers already made a lot of their information available (Facebook, Twitter). As for impediments to mass adoption, Milne cited POS integration as the biggest hamper and also ACH, since non credit card transactions are bigger than their credit counter parts. Milne see big banks not as competitors, but as integrators as they are faced with the same challenges posed by ACH transactions. Jacobson predicted that credit card will always exist but will become a subset of the market. This was the last session I attended, I started feeling the effects of information overload and decided to call it a day. The Core Conference was a successful event in my eyes, I got to network with a lot of people I already knew as well as meeting some new ones, and I gained some valuable insight from the sessions I attended. Kudos to the DCWEEK team for putting this event together, and I am one of those who will be on the lookout for the next iteration a year from now.